Nine teams sought to qualify in order to represent Costa Rica in the R6 World Rafting Championship to be held in Australia in May 2019. On September 22 and 23, the Rios Tropicales Cup was carried out and brought together the best rafting athletes in the Pacuare River, in a competition that would award them with a ticket by category to represent Costa Rica in that country. Costa Rica has had a global presence since 1994, in both R4 and R6 categories, that is, rafts of four or six people. On this occasion, the Cup will be held in the R6 mode (with six participants per raft). The tournament format is distinguished by being unique and different, since it is an expedition as well as a championship. "The tournament was held in different areas of the river. We were going down. The first two competitions (“sprint” and “head to head”) took place in the Linda Vista River, then descended to the stretch in front of Rios Tropicales Lodge for the slalom and the next day it left there to the Siquirres River," said Rafael Gallo, owner of Rios Tropicales. Due to the characteristic of the competition, while the teams move along the course it was very difficult for the fans to observe the competition completely, given the natural characteristics of the place. The categories that were disputed were five: Open Masculine and Feminine, Master Masculine and Feminine (participants of 40 or more years), and Junior category (competitors of 19 years or less). The winners now have the opportunity to compete in the Australian World Cup that will run on the Tully River, which has very similar characteristics to those of the Pacuare River, which will signify an advantage for the Costa Ricans. In the section, the national championship is open to any company or group that wishes to participate. "The climate and mother nature will dictate the agenda, depend on the water levels. The slalom has to be done twice in the same route and we depend on how he treats us, " mentioned Gallo days before the competition. Unlike other events, competitors shared a way of living together with other teams to promote a good atmosphere and good treatment in this sport. Sprint: This time trial takes place at a distance of between 400 and 500 meters from the riverbed. It is done individually, one team after the other. Head to head: In sprint distance, this time the competition is between two teams that leave at the same time. In addition, unlike the sprint, there was buoys moored in the path that the raft had to skirt. Slalom: the route varies in distance. Structures or gates flow over the riverbed and, depending on the color, participants had to cross it upstream or downstream. In case of not crossing legally, the team would lose points by penalty. Downriver: It's a descent between 25 and 40 minutes of resistance, which is also a time trial. White water rafting is an even more popular, extreme and thrilling outdoor activity in which, using an inflatable raft, people navigate a river and its exciting rapids. But, what are those rapids? In rafting terms, the rapids are those sections of a river where the riverbed has a relatively steep gradient, causing an increase in water velocity and turbulence. This is what adds more adrenaline to the tour! In its origins, the rafting was a mean of transportation for people and food; but after some time, rafting companies were established in routes like The Grand Canyon, and this made that rafting started to be considered an extreme sport, besides a curious part of the adventure tourism offers in many places. In fact, white water rafting became a popular leisure sport since 1970's, and has evolved from individual rafts to multi-person rafts steered by a tour guide at the stern. 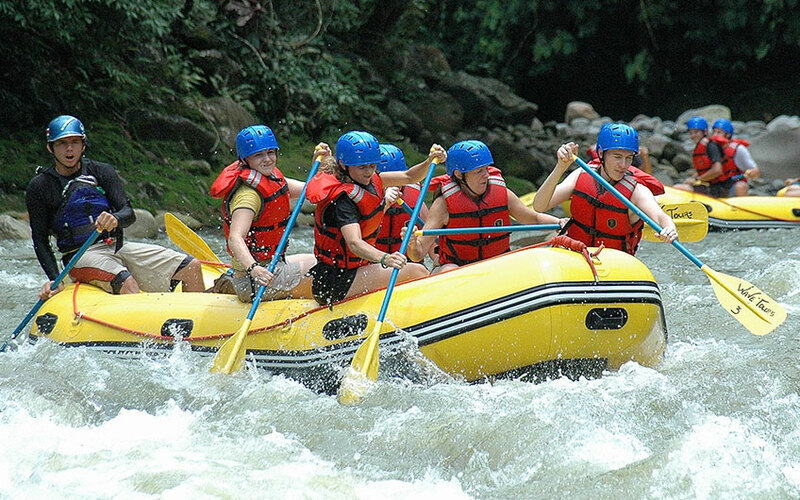 In Costa Rica, rafting is very popular across the country, as there are excellent rivers to practice it in Sarapiquí, Turrialba, La Fortuna, Guanacaste, just to mention some of them.